Here’s my spin on a traditional favorite, made with all real food ingredients. 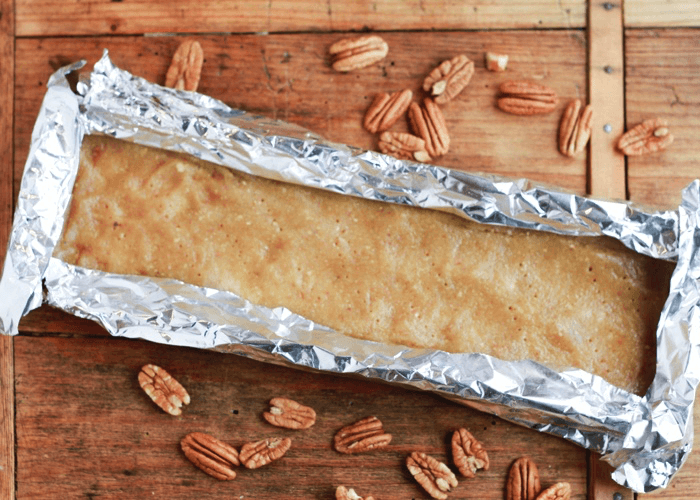 Hello there, sweet little grain free pecan tart! I am stopping by the blog today filled with gratitude and awe. My little blog is turning 3 years old in a couple of weeks. Never in my wildest dreams did I ever think that I would be food blogging for a living. But hey, just look at me now. The past 3 years have been an incredible journey filled with learning new skills, meeting amazing new people, and life changing happenings. What started as a creative outlet for my food obsession has now become a life journey and a new career. Who would have guessed? I barely knew how to work my computer or take a photograph 3 years ago. As I sit here looking back at the past few years, I am taking stock of where I have been and where I want to go. The coming of the New Year tends to inspire this introspection in me. It’s a time for looking at what I have accomplished. A time for taking a deep breath to slow down and check in with myself. Am I where I want to be? Is this making me happy? Am I still growing? What internal work do I still need to be doing? I cherish this dark time of year when I can pull in to take a deeper look, to rest, to recharge. I spend most of my time putting energy out into the world. It is now time to inhale deeply and settle into the quiet space of Winter in hopes of emerging rested and rejuvenated in the Spring. Can you relate? Anyone else just feel like curling up on the couch next to the fire? But even in the winter, I am cooking and creating in the kitchen. Today’s recipe is one that has been on my mind for quite some time. It is an ode to the many years I spent in the deep South where pecan pie is actually pronounce pee-can pie. Can you hear my slight Southern drawl? Most of you don’t know that I learned to speak English in the deep South when I moved there from my homeland, Finland. 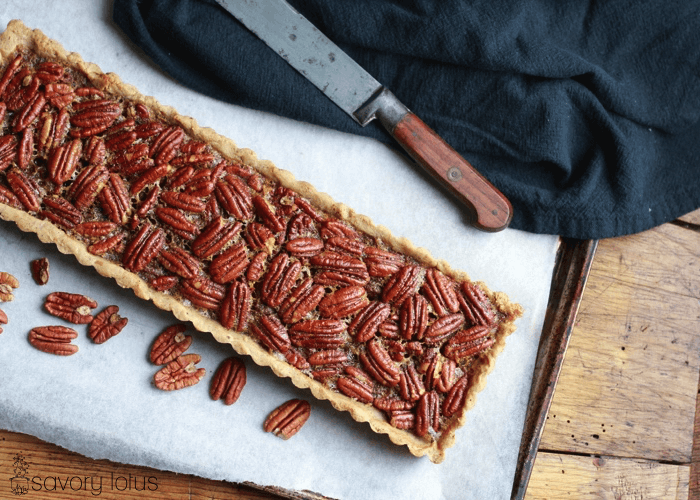 What I love about this recipe for grain free pecan tart is that it is a beautiful dessert. While pie is always fun, a delicate tart is just a bit more sophisticated. And that is where I am headed with Savory Lotus. I am ready to turn up the notch a little bit. I’m ready to express myself in a more sophisticated way, with a new look and better photography. So I guess that is my goal for the next year. Take better pictures. Make prettier food. Express myself more from my heart. Hope that OK with ya’ll. Oh, and I hope you enjoy the pecan tart. It’s really amazingly good. I used real food ingredients. No high fructose corn syrup, of course! The secret is to toast the nuts before to bring out the flavor and crunch. My family was very pleased. My little one was anxiously awaiting a bite even while I was trying to get these shots. Wishing you all a happy and healthy holiday season and a New year full of abundance and good food! Preheat oven to 350’F. Place one and half cups of the pecans onto a baking sheet and toast for 10-12 minutes, giving the pan a shake once or twice for even baking. Remove from oven and set aside. In a food processor, pulse half cup of pecans until like a very coarse flour. Add almond flour, coconut flour, and salt. Pulse to combine. Add egg, maple syrup, and fat of choice and process until fully incorporated. Using your fingers, press mixture into a 4×13 tart pan. Using thin strips of aluminum foil, loosely cover the sides of the crust. Poke the bottom of the crust all over with a fork (see picture below) and bake at 350″f for 14 minutes. Remove from oven, remove tin foil, and cool completely. In a medium pot, whisk together maple syrup and fat of choice. Heat on medium heat and add coconut sugar, molasses, and salt. Whisk until fully incorporated. Allow to simmer gently for 1 minute, stirring continually. Remove from heat, pour into a large bowl, and allow to cool for 5 minutes. Whisk in eggs, one at a time. 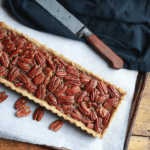 Scatter toasted pecans evenly onto pre-baked crust. Slowly pour wet mixture over pecans, giving the tart pan a little jiggle to evenly distribute. Bake tart for 25-30 minutes, until set and slightly puffed up. Allow to cool completely before cutting and serving. Hi, Brett! Thanks so much for catching that. I just had a complete site re-design and all of my recipes were retyped and reformatted by a designer. Looks like the molasses was left out of ingredient list. I fixed it. I appreciate you letting me know. I am combing through hundreds of recipes to catch mistakes. A big job, but I love my new design. 🙂 Thanks for stopping by! What size round tart pan can I use. Don’t want to go out and buy another tart pan and I think more people have round ones. Might be helpful to include substitution in your receipe. Yes, thank you! Just in time for my Thanksgiving cooking. Appreciate the timely response. Congrats! So fun to know how long you’ve been doing this. 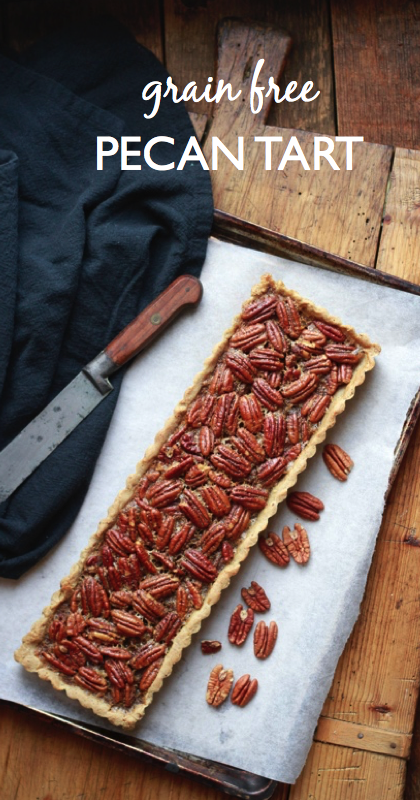 And this pecan tart is gorgeous! Love it! I love the way this looks in the rectangular tart pan, so gorgeous! These are almost too pretty to eat! 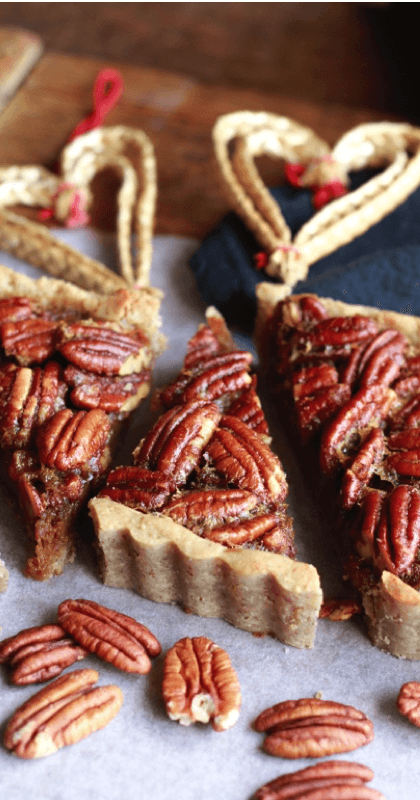 Pecan desserts are my dad’s favorite, so I may have to make these for Christmas. HA! Thanks, Jean. I love love prety food. Hope you get a chance to make this for your dad. yuuuuuum look at them pecans! this looks fabulous – drooling! I love that bit of molasses you put in your filling! 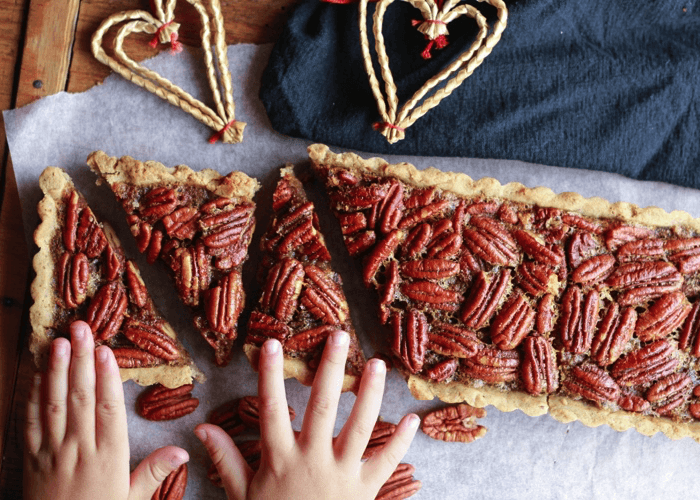 Pecan pie is definitely a staple during the holidays. Thanks for your version! I was thinking the ingredient list would be more complicated! This is so pretty and so simple! Definitely trying it! You are right- this tart is beautiful and elegant. It looks so delicious and like the perfect dessert. Happy blog birthday! You’re so talented. I love this recipe. How perfect for the holidays! This looks absolutely amazing! I love pecan anything. I can’t wait to make it. What a stunning tart! That crust looks like flaky perfection! 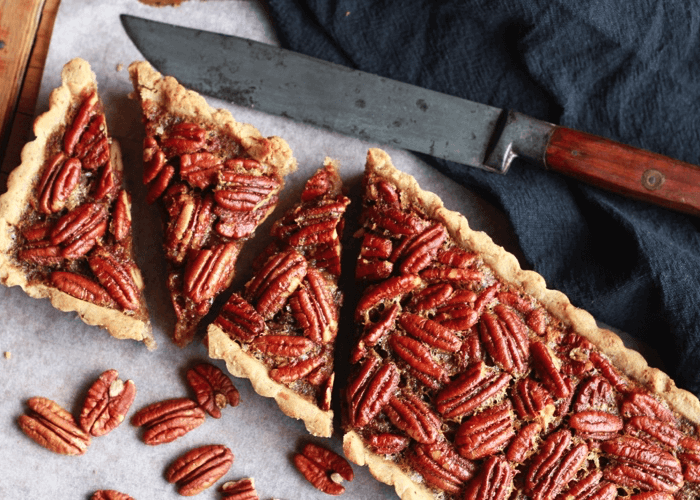 This pecan tart is gorgeous and delicious. Perfect for holiday season ! I love pecan tarts! And the photo with the little hands is adorable. What a beautiful tart! My rectangular tart pan is just dying to be used to make this!